We start from creating an eclipse application that will contain the editor. Choose to build a new RCP application. Before to start the implementation, we need to add some dependencies from out project to external plugins. Open the plugin.xml, select the extension tab, then proceed for adding a new “Open File” command. 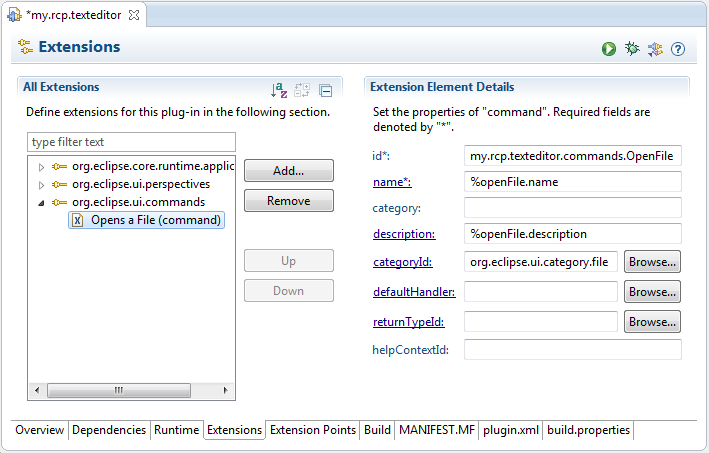 Click on Add.., type *comman and select org.eclipse.ui.commands to add the extension. Add a command by right clicking on org.eclipse.ui.commands node and select New > command. Finally Fill fields for command as shown in the right side of the image below. For our command we defined an id: my.rcp.texteditor.commands.OpenFile. Take note of this, since will be used further. We want that our Open File Command is handled by our code, thus we need to write an handler for the OpenFile. Write my.rcp.texteditor.handlers as package and create the class OpenFile extending AbstractHandler and implementing IHandler. 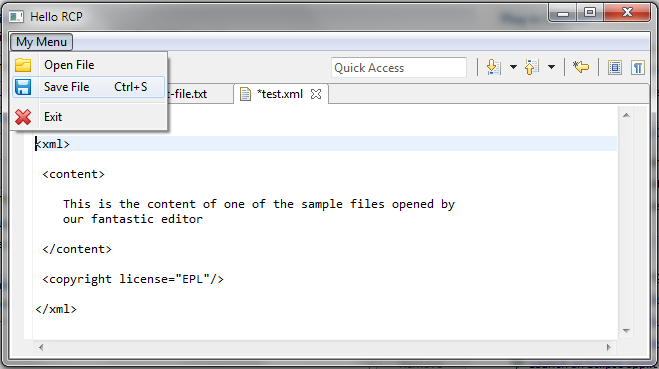 The Open File Command first Opens a file selection dialog, for selecting a file, then ask the workbench to open the file with the default editor. Substantially The Eclipse Text package contains many editors, and we use the EditorUI to get the identifier for the default editor. From extension tab of the plugin.xml, we add the extension org.eclipse.ui.menus. Now select the menuContribution node, and add the menu, by right clicking and selecting New > menu. To the menu we add the Open command, by right clicking on menu node and selecting New > command. The Menu node should looks like the following image. To test the application, go to the first page of the plugin.xml, and click on the “Launch an eclipse application” hyperlink. You could see the application running. By clicking on “My Menu > Open File” you can select a file and edit it. Moreover you’re full of RCP stuffs, like opening more files, etc..